What is couscous? Well, it’s is a North African dish of semolina (the coarse, purified wheat middlings of durum wheat) traditionally served with a meat or vegetable stew spooned over it. I have found it to be a wonderful option as a side dish to many different main courses. I tend to serve it mostly alongside fish, (as I did here) but it goes with nearly everything! That being said, the hubby and I love us some good couscous. The texture is a little bit choppier than rice, yet somewhat resembles small beads of pasta. You wanna know another GREAT reason to add this to the menu? Couscous is ready to eat in less than 10 minutes (that even includes water boiling time)! All you do is add boiling water to couscous, cover it, and let it set for 5 minutes. Fluff it with a fork, then serve & enjoy! It really doesn’t get much easier than that, folks. Of course I wanted to take my couscous to a higher level by adding in a little extra flavor. This may tack on an extra 3-5 minutes, but I promise it is SO worth it! Heat garlic, onion, and salt in sauce pan with olive oil over medium heat. Stir and cook until onion becomes translucent (about 2-4 minutes). Add couscous, toss until couscous is coated. Cook, stirring often, until some of the grains are just beginning to brown, about 3 minutes. Meanwhile, in a separate sauce pan (or in the microwave) heat broth, bringing to a boil. 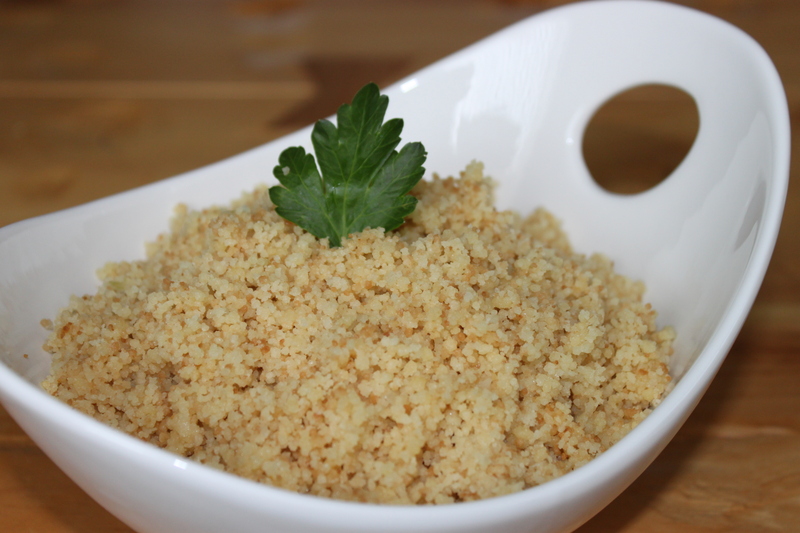 Once couscous has begun to brown and get toasted, remove from heat. Carefully pour hot broth over couscous, quickly stir to combine, and place lid on saucepan. Let set for 5 minutes. When 5 minutes is up, fluff with a fork and throw in parmesan (and S&P to taste). I made your couscous this week to go along with some garlic chicken that I had put in the crock pot and it was delicious! And so easy! I’m loving your blog! Thanks! Hooray! I’m so glad you enjoyed it . . . it would go wonderfully with garlic chicken too!! Yum! You are a good little cook.